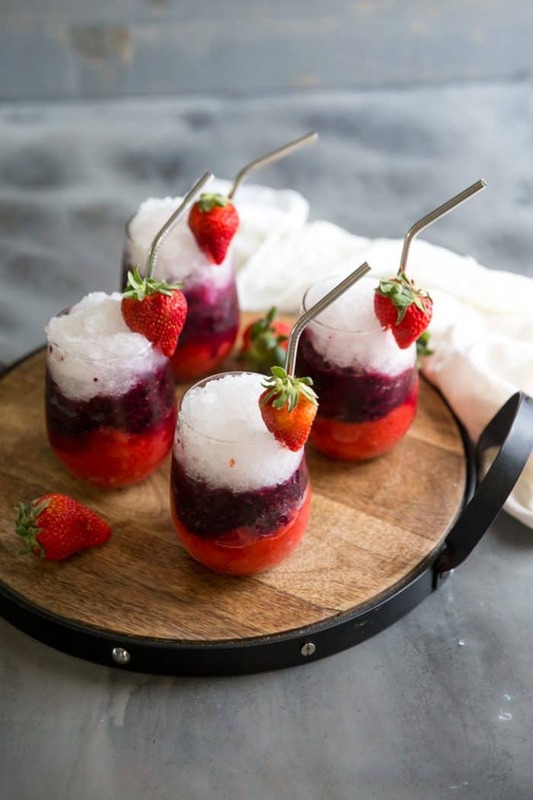 Nothing is more festive than these red, white, and blue vodka slushies! 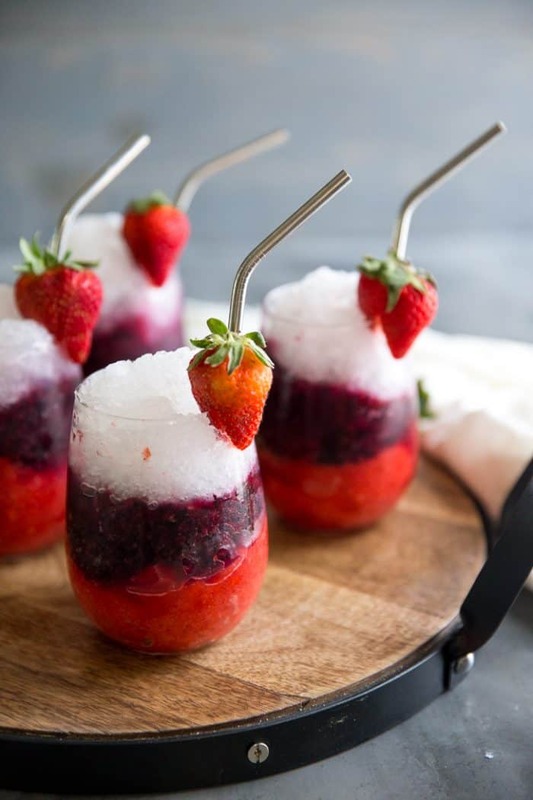 These slushies are made with real fruit juice and are the perfect summer drink! Every holiday or event seems to have a signature cocktail. 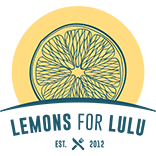 We drink Mint Juleps for the Kentucky Derby, Bubbly Fuzzy Navels for Mother’s Day, Champagne drinks for New Years, Bubbly Irish Cocktails for St. Patrick’s Day, Kir Royals for Valentine’s Day, Margarita’s for Cinco de Mayo and Cranberry Daiquiris for Christmas. Some of these drinks have to do with the ingredient color and how it relates to the season (cranberries for the holidays for example), but some, like the Mint Juleps, are steeped in tradition, while others are just plain fun. 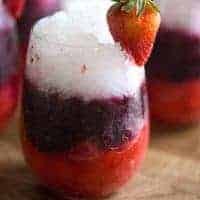 This vodka slushie recipe is both seasonally appropriate fruit and color-wise and damn, it is just plain fun to drink! This recipe is super simple, it just takes a little planning. 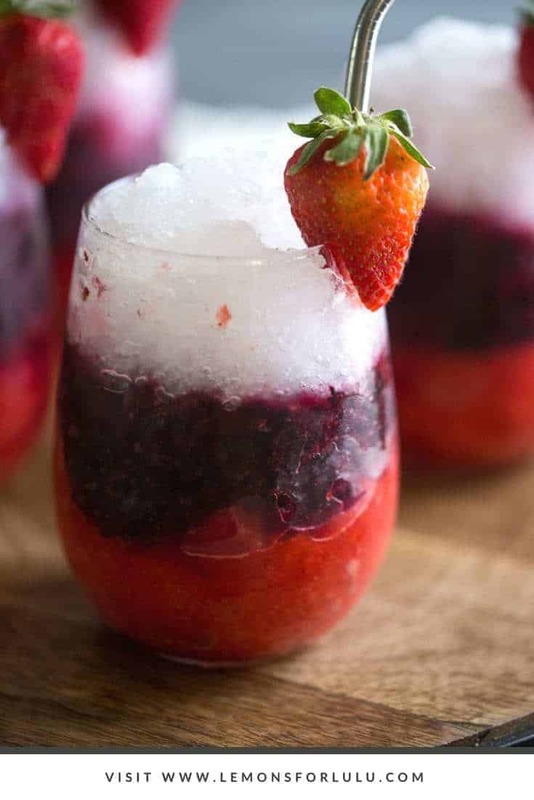 I use frozen fruit, lemonade, vodka and ice for each layer. The red layer is made with frozen strawberries and lemonade, substitute raspberries if you’d like. The blue layer is made with frozen blueberries and lemonade but blackberries would work very well. The white layer is simply ice and lemonade. Vodka is added to each layer, but you can 100% omit the vodka for a family friendly summer drink option instead. I pureed each layer in a blender (I did not thaw the fruit), then allowed them to sit in the freezer for at least 30 minutes. Because of the alcohol, they will not completely freeze. The white layer needs the most ice as there is no fruit to bulk it up. Keep each mixture in the freezer until ready to serve, once you scoop up your layers into your glasses, serve immediately. Memorial Day and the 4th of July just got their “signature drinks” at least according to me. 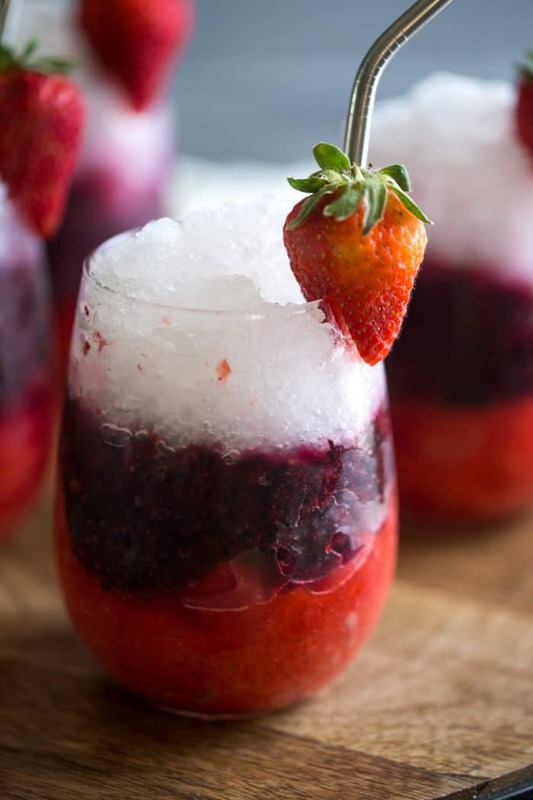 Nothing is more festive than this red, white, and blue vodka slushies! 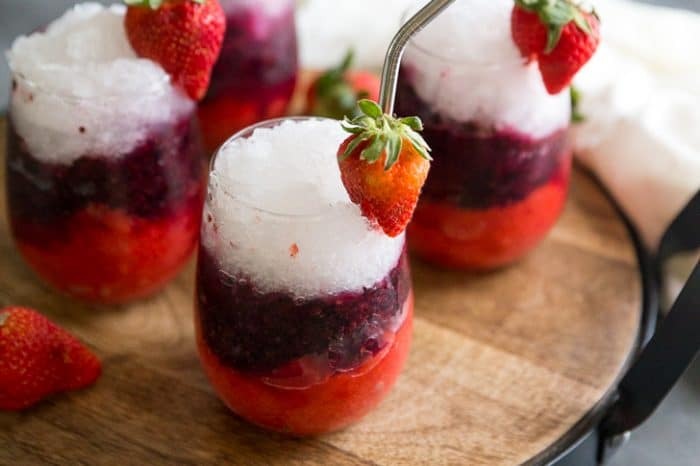 These slushies are made with real fruit juice and are the perfect summer drink! In a blender, combine 1 2 oz vodka, strawberries, 1 cup of lemonade and 1 cup of ice in a blender. Blend until combined. Place mixture in a container and place in the freezer. Rinse blender. Combine 2 oz vodka, blueberries, 1 cup of lemonade and 1 cup of ice in the blender. Blend until combined and pour into a separate container; freeze. Rinse out the blender. Combine the 2 oz of vodka, remaining 1 1/2 cups of lemonade and ice in the blender. Blend until combined. Pour into a third container and freeze for at least 30 minutes. Layer a scoop of each mixture into separate glasses. Serve immediately.